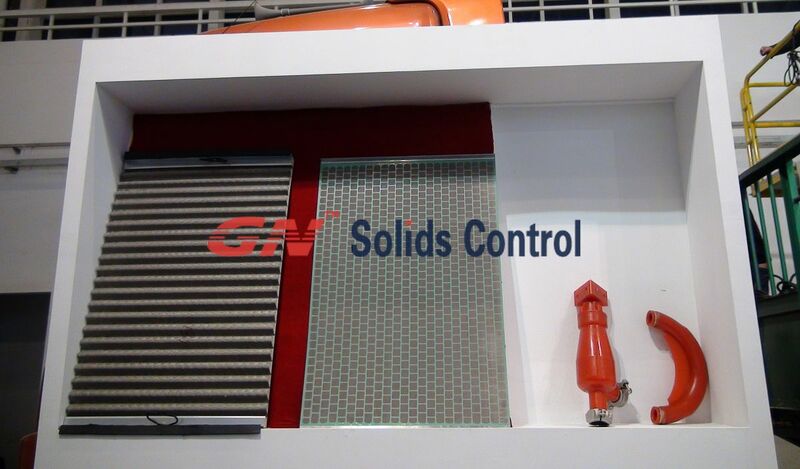 See the photo on the right, it is a mud circulation system with mud gas separator, in oil drilling solids control system, the 1st phase cleaning equipments of mud circulation system is shale shaker, which is fed the mud from high pressure manifold, the mud gas separator is fed mud from the chock manifold. 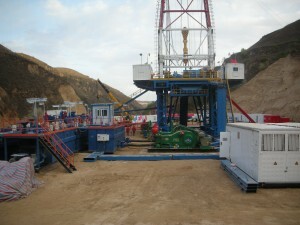 When much of harmful gas is found during drilling, they close the valve to stop feeding the shale shaker, and open the valve to feed to mud gas separator, and use hundreds of exhaust pipe to transfer the harmful gas from mud gas separator to a place far from well head, and use flare ignition device to burn it. 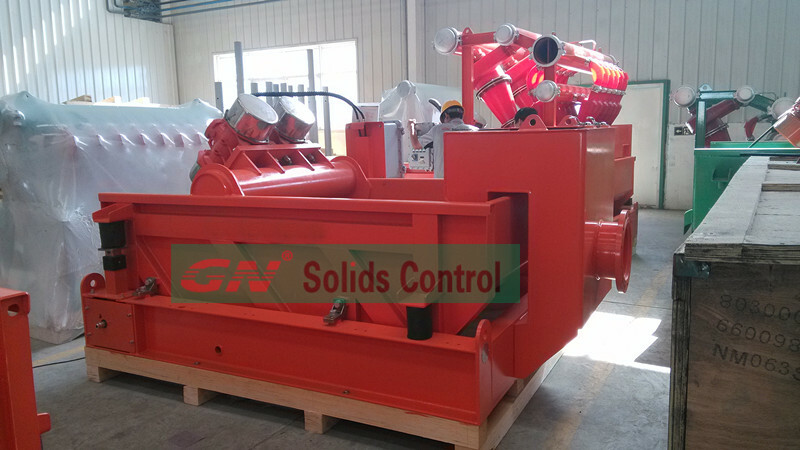 Mud gas separator is not a part of solids control system, GN can manufacture both of them, so we put them together for your convenience. Mud circulation system is also called mud cleaning system, mud recycling system, solids control system, Usually if a mud circulation system with mud gas separator, it is usually oil & gas drilling or geothermal, it can not be HDD or water well drilling. 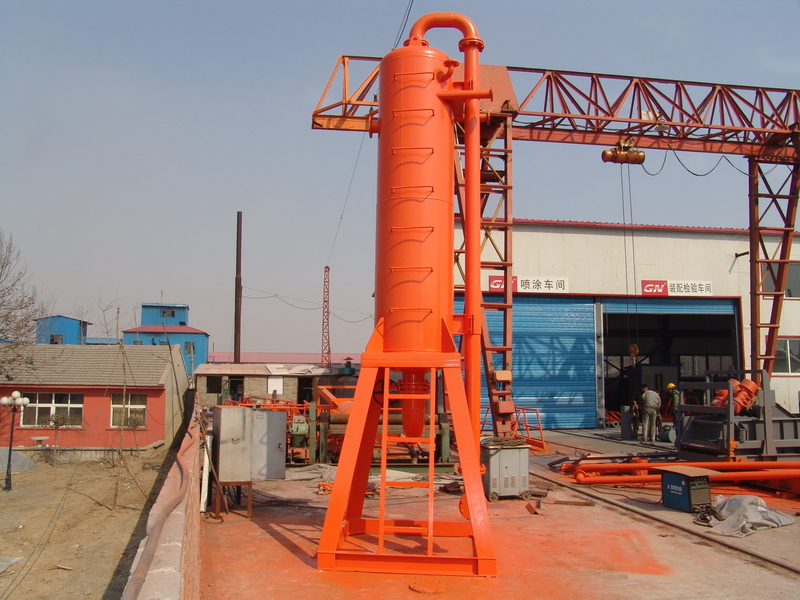 Mud gas separator is horizontally installed on the skid with the chock manifold on it together, it is easy for transportation. 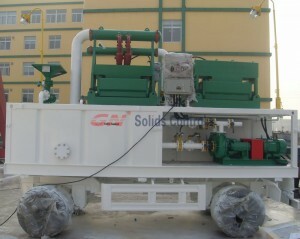 GN solids control mud system can be used for both oil & gas drilling and water well drilling. 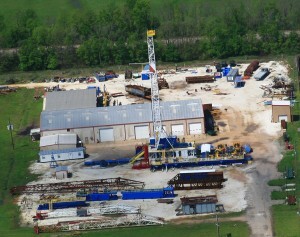 Water wellis an excavation or structure created in the ground by drilling to access groundwater in underground aquifers. Most shallow well drilling machines are mounted on large trucks, trailers, or tracked vehicle carriages. Water wells typically range from 3 to 18 m deep, but in some areas can go deeper than 900 m.
Most of the water well drilling rig is trailer mounted or truck mounted, for convenient transportation from one place to another. Some contractors do not process the used mud from water well drilling, but recently there are more strict laws for environment protection, they have to search for small mud recycling system to complete the job. They prefer trailer mounted mud system, GN 200gpm trailer mounted mud recycling system is widely used for water well drilling. Total transportation dimension is 5500x2300x4000mm( including the trailer height), it meets the transportation limit in most of the countries in the world( you do not need to remove anything when transport in domestic). You only need to remove the mud cleaner and shale shaker from the tank, then I can fit for 40feet standard container. 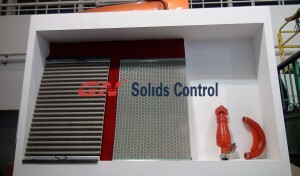 GN solids control will attend Brazil Offshore Conference 2011 held in Macaé Brazil. Here we will show shaker screens for world famous brand shale shaker and for GN shale shaker. Macaéis a city located in the Brazilian state of Rio de Janeiro, 180 km northeast of the state capital. Macaé is generally considered to be the centre of the Brazilian offshore petroleum industry. As a consequence it is often referred to as “Cidade do Petróleo” (“City of Petroleum”). The Brazilian state-controlled oil company – Petrobras – has many facilities within the town. Brasil Offshore is the biennial conference & exhibition for the Brazilian Offshore Oil & Gas Industry. Held in Macaé, which is the operational base and accounts for over 80% of Brazil’s offshore exploration, the event attracted a global audience of over 49,000 professionals and 636 exhibitors in 2009.
Who attend Brazil Offshore Conference 2011? The scope of exhibitors at Brasil Offshore stands out for its diversity: manufacturers, importers, distributors and suppliers of a wide range of products and services related to the oil & gas offshore industry. 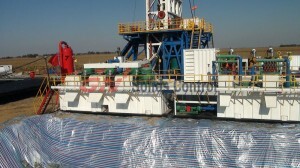 Work over drilling rig mud system is also one kind of solids control system in drilling work. 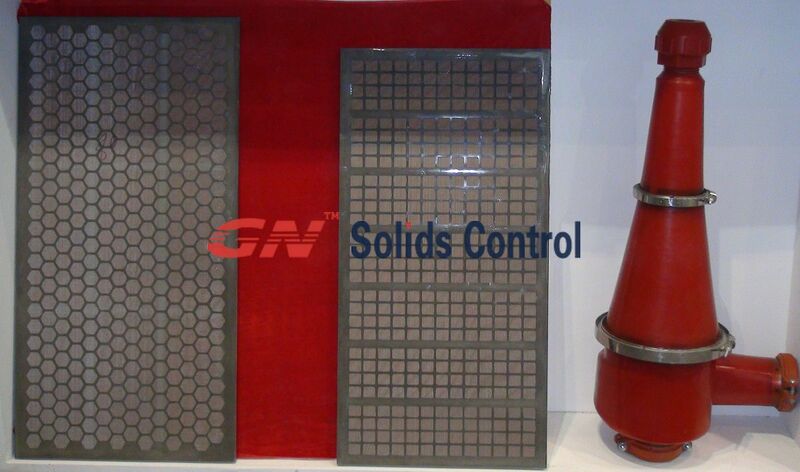 And GN Solids Control is professional at this kind of mud system. After 2 mud tank systems for workover drilling rig to Indonesia, and Drilling mud system and mud mixing system for Australia, today Another 2 Sets XJ550 HP Petroleum Workover Drilling rig solids control mud system are finished within 40 days ready for delivery to Kazakhstan. 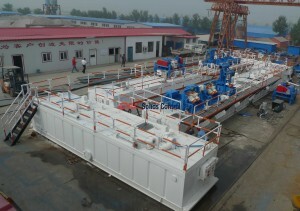 The workover rig mud system is usually contains shale shaker, decanter centrifuge, and mud tank. The desander and desilter is optional, it depends on the environment you faced. Drilling mud suction tank is the requirements of our client mud system second tank.The first tank :Oilfield shale shaker tank (1). Details of the mud suction tank for the 1000HP drilling mud system. top grating. includes tubing handrials and toe boards. one (1) psi 10 hp mud agitator supplied and mounted in pill compartment. one (1) psi 10 hp agrtator supplied mounted in each suction compartment. three (3) 3’’ bottom mud guns with butterfly valves. three (3) 10’’ butterfly valve clean-out gates – one (1) in each compartment. two (2) 10’’ suction lines, one (1) for each mud pump. 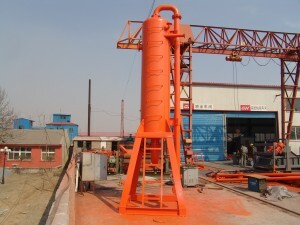 mud pump to be capable of suching from any compartment. one (1) mud lap on suction tank with 1’’ water tap. 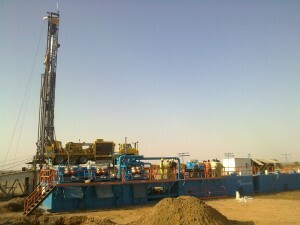 A Client from Indian ask us for Tendering Diesel Electrical Land Drilling Rig and mobile drilling rig. There will be Tender coming from Oil India Ltd. in one and a half months’ time. This tender is mainly for buying a 2000 HP Diesel Electrical Land drilling Rig with 1000 KBPS Mast and Substructures conforming to API 4E or 4F with optional VFO and also one 750 HP Mobile drilling Rig. The specification is under preparation. Customer have put a restriction that they will prefer a company who has 15 years API Certificate in offering drilling rigs. We deliver complete, integrated mud system packages for installation on land rigs. Our focus is on delivering custom-designed products and a quick and cost-effective mobilisation and demobilisation process. We offer a range of world class drilling fluid systems for installation on new builds or upgrades of existing offshore rigs including jack-ups, semis and platforms. GN Drilling Mud engineers and manufactures a range of drilling fluid systems and equipment. All products are available either as stand-alone products or as part of a bigger package. China Horizontal directional drilling(HDD) rig ,HDD Equipments,and machines manufacturer list.As a Chinese Horizontal directional drilling mud systems manufacturer.GN Solids Control people collect some best suppliers list of HDD rig to worldwide clients. Vemeer China VBM Company, is Balama VBM : Vermeer Beijing Manufacture Joint venture Vermeer USA with Balama China,Specializing in manufacture and sales of vermeer horizontal directional drilling rig.